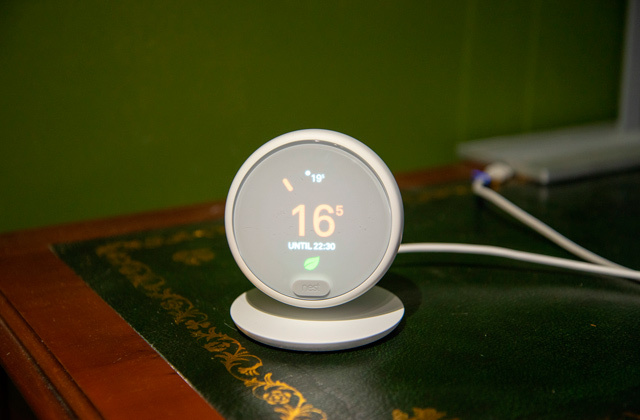 The fan set comes complete with a remote control to turn the unit and lights on/off and change the fan speed. IR sensor is very powerful and sensitive ensuring efficient control even from a long distance. Somewhat painstaking installation due to the item heavy weight. 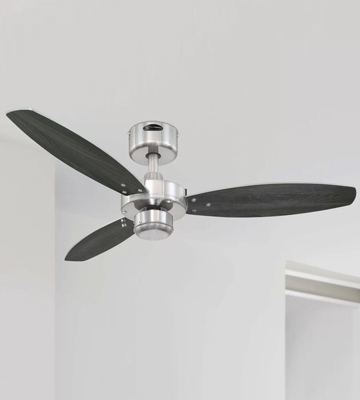 Featuring a powerful motor and unique blade design, this ceiling fan with remote stands out for an impressive cooling performance. It is suitable for the use in pretty large premises and can efficiently cool areas up to 30 sq.m. Besides, it doubles as a light fixture, and an 80W halogen bulb is already included in the package. 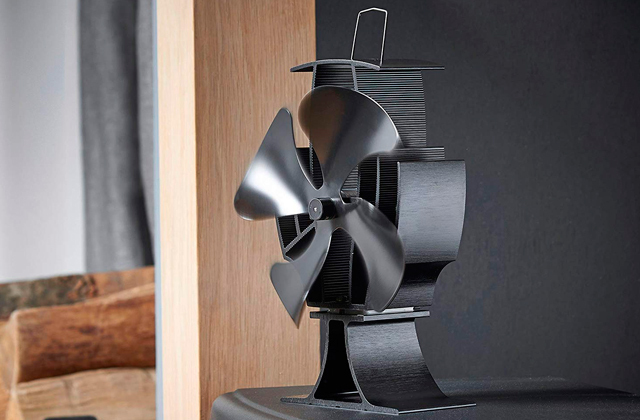 Fan blades are made of light yet solid and durable wood. They boast excellent aerodynamic characteristics and greatly increase the unit operational efficiency. Pulling cords are pretty short. If you need a stylish ceiling fan that will perfectly blend with the interior of your living room, dining room, or bedroom, the MiniSun ceiling fan with light is one of the best options to go for. Reversible blades will allow you to choose the colour to your liking and ideally fit into your home design. A unique light fixture shape in a combination with a 60-watt bulb (to be purchased optionally) allows creating a functional light stream bright enough to illuminate an average-sized room. The operation might seem a bit noisy. 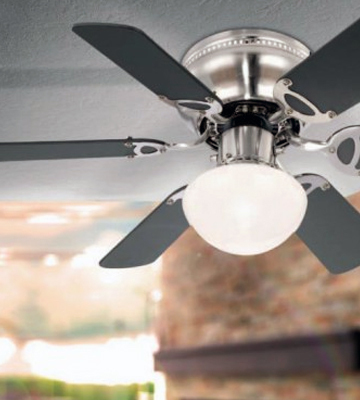 This elegant and versatile ceiling fan from Westinghouse will let you handle two major tasks. It can be used both as a functional light source and as an effective air cooler. And you'll get all of this at a fairly affordable price. A minimal number of component parts and intuitive assembly instructions make the item assembly a real snap, requiring no specific tools. Besides, the package includes all the necessary hardware for quick and simple unit mounting. The item features only 3 blades. Designed for average-sized rooms, this model will become a great choice for those who already have some kind of ceiling lights and need a compact and reliable air cooler. 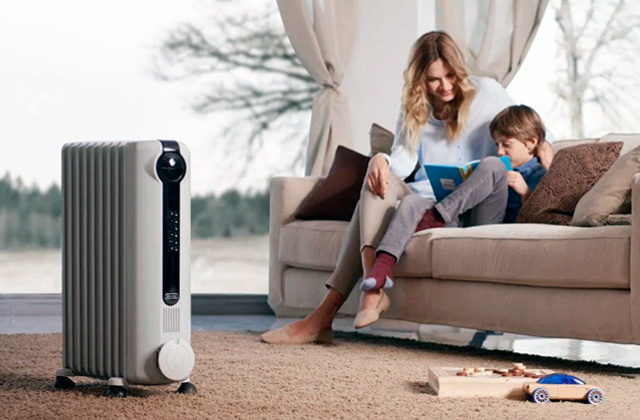 Fitted with summer and winter operation modes, the fan can be comfortably used all year round. An integrated light fixture is specifically designed for energy-efficient LED bulbs. This solution will let you enjoy bright and functional light along with air cooling effect without increasing your energy bills. Distinguished by an impressively small diameter of only 76 cm, the Globo fan light will find its place even in a small bedroom, nursery, or den with low ceilings where every cubic centimetre of space counts. 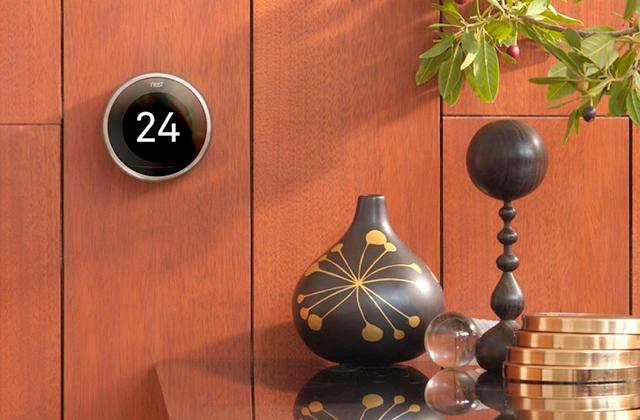 Meanwhile, it will efficiently handle the air circulation on the area of up to 12 sq.m. 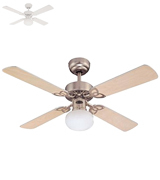 Being a true and indisputable leader in its market segment, Westinghouse offers a really wide range of ceiling fans in different styles and designs and the Bendan is by far the most popular model among the Westinghouse ceiling fans with lights. The model features a contemporary steel housing with a satin chrome finish and 5 tapered blades made of plywood. The ball-shaped housing encapsulates the light fixture with a halogen bulb hidden behind the glass. A combo of metal, wenge colour wood, opal frosted glass, and smooth flowing lines gives the fan a very modern and a kind of futuristic look. Such design will perfectly blend with high-tech, minimalistic, city-style, industrial, and fusion interiors. Packed with a super quiet yet powerful motor, the Bendan fan generates almost no noise during operation that makes it a great choice for bedrooms. Meanwhile, large blades can rotate at 3 different speeds to produce a highly intensive airflow for efficient cooling of premises up to 30 sq.m in the area. The light fixture has a dimming function to create soft ambient illumination for the night time. On top of that, this model comes packed with a remote that will let you adjust the fan operation without even the need to get up from the couch. Meticulously designed up to every tiny detail and providing the convenience of remote control, the Bendan fan light from Westinghouse is a perfect solution for creating a comfortable living environment in your dwelling. The initial function of any ceiling fan is to cool the air in the premises by enhancing the air circulation. Hence, the cooling effect is one of the major selling points when it comes to choosing a ceiling fan. However, the item design is not less important since modern ceiling fans are used both as functional units and as pieces of decor as well. 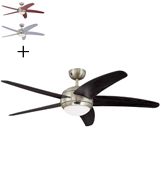 The MiniSun ceiling fan is a great example of functionality cleverly paired with “fits-all-styles” design. See for yourself. The item features a pretty much traditional look you can come across in colonial and rustic styles. A metal body in a white finish and a lamp of white matte glass will be almost invisible on white and close-to-white ceilings. Meanwhile, the blades are reversible. You can go either for white colour if you want the item rather to fuse into room interior or for a wooden finish to achieve a kind of beach-house effect. Lightweight yet pretty stiff, 4 fan blades boast excellent aerodynamic characteristics and ensure efficient air circulation. 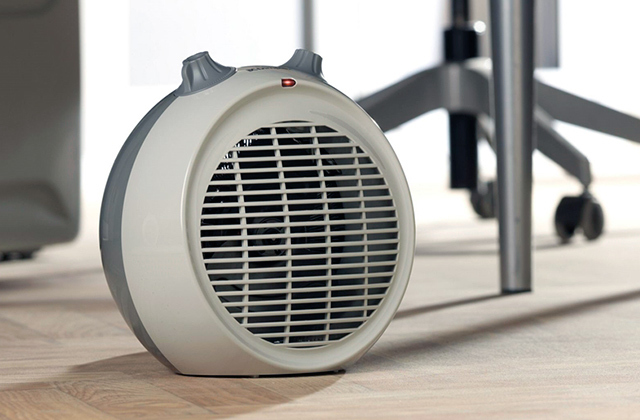 1060 mm in circumference, they rotate at 3 variable speeds (from low to high) to get the optimal cooling effect depending on the indoor air temperature, time of the day, and your personal preferences. Besides, a directional motor ensures both forward and reverse blades rotations allowing you to use the fan in summer and winter conditions. If you need a stylish ceiling fan that will perfectly blend with your home interior, the MiniSun ceiling fan with light is one of the best options to go for. 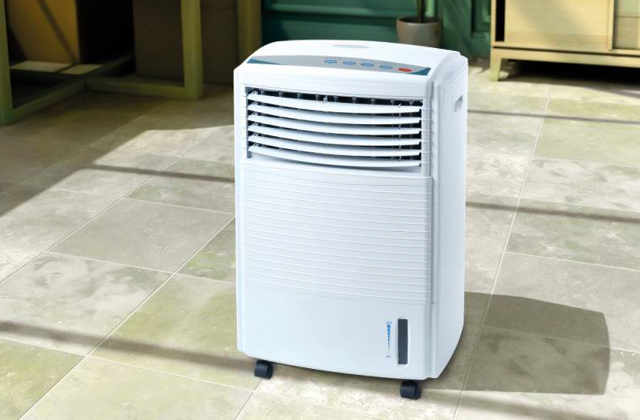 Suitable for any mid-size room, it will bring a cooling breeze to your living room, dining room, study, or bedroom. 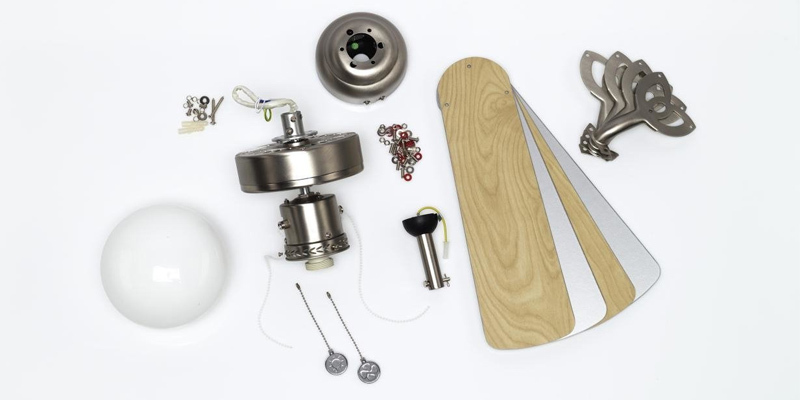 Westinghouse is a well-known brand name not only in ceiling fans but also in lighting fixtures. The company offers a number of efficient and practical solutions for all sorts of applications and effectively integrates those solutions to make highly functional all-purpose products. The Vegas ceiling fan with light is one of such products. 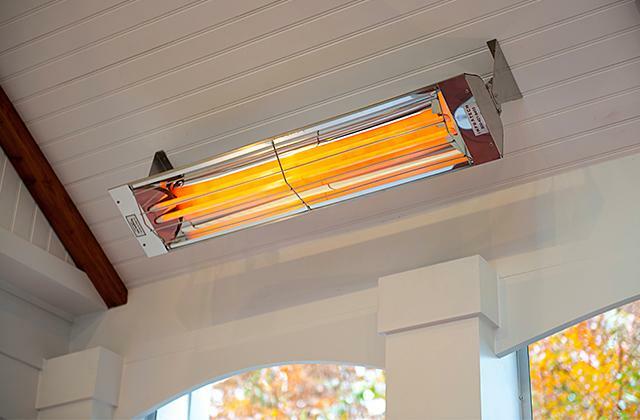 It’s a hybrid model combining the functionality of a full-scale light fixture and forceful air cooler. A unique lamp shape along with a 60-watt bulb (to be purchased optionally) allows creating a functional light stream bright enough to illuminate an average size room. Hence, if you have no ceiling lights in a bedroom, dining room, study, hall, or kitchen, this item can be used instead of a chandelier to efficiently light the space up. Moreover, the unit design even reminds an exquisite chandelier. Chrome housing with ornate blade holders, propeller-like blades, and frozen glass lamp create a well-balanced look that will fit any traditional decor, be it country, rustic, classic, or vintage style. Besides, the lamp is compatible with LED bulbs that make it also an energy-efficient light fixture. The air cooler function of the Vegas fan is ensured by a quality forceful motor hidden behind a durable and solid metal housing and 4 fan blades. 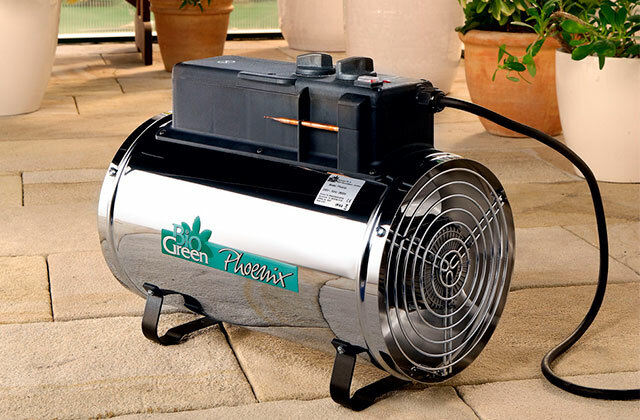 The motor delivers powerful performance and high-speed blade rotation allowing the fan to efficiently cover the area up to 20 sq.m. With that, the fan consumes only 39 watts per hour which is one of the lowest power consumption rates in its class. 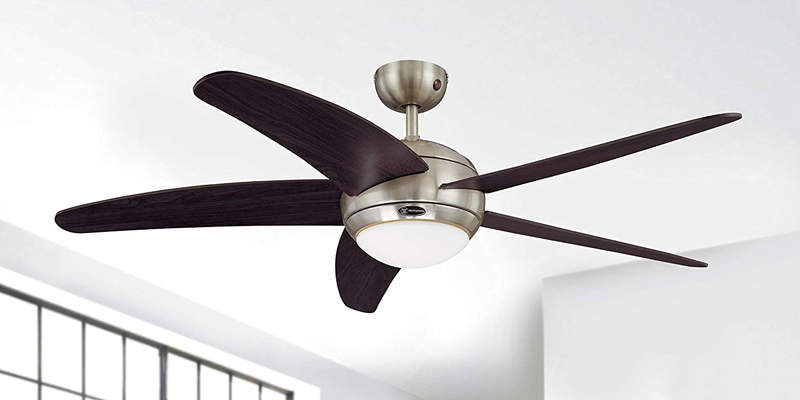 Distinguished by double functionality, the Westinghouse Vegas ceiling fan is a perfect model for those rooms where you need both an added full-scale light source and an efficient cooler. Moreover, you’ll get all of this at a fairly affordable price and further save on electricity bills. If you look rather for a reliable and long-lasting air cooler and don’t actually need an extra light source, the Westinghouse Jet ceiling fan is for you. It’s a contemporary version of a traditional model widely used at homes, hotels, cafes, restaurants, and other public places for decades. 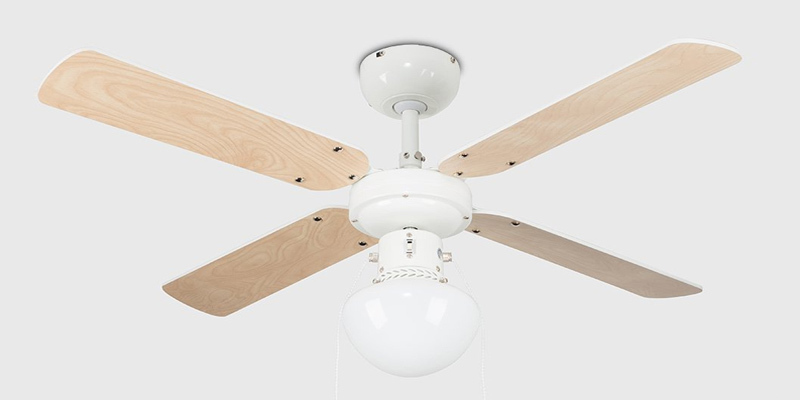 The first thing you will like about this model is a no-hassle assembly (in contrast to other ceiling fans that often appear very difficult to put together). A minimal number of component parts and intuitive instructions make the item assembly a real snap, requiring no specific tools. Besides, the package includes all the necessary hardware for quick and simple unit mounting. An all-metal unit construction is highly durable and will easily withstand years of extensive use. At a glance, the item strongly resembles the airplane propeller. Brushed metal housing with three blades looks minimalistic style, making it a perfect fit for the majority of modern interiors. Besides, reversible blades will further enhance the fan versatility. Thus, if you want to add a touch of industrial style to your interior, you can choose a silver side while a Wenge-coloured side will add some contrast. 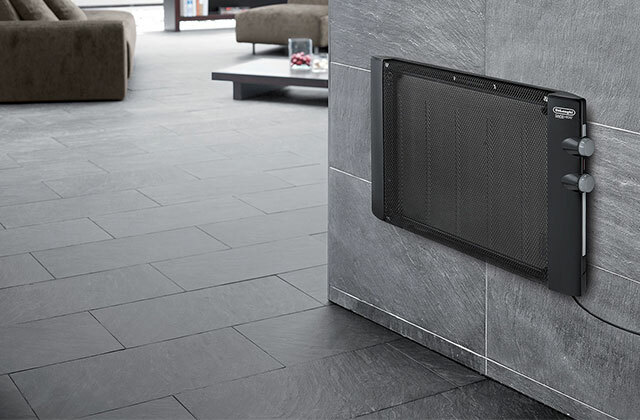 With regards to the Jet fan performance, it is designed to improve the air circulation and achieve a comfortable cooling effect in medium rooms up to 20 q.m. What’s more, during a cold season, you can set the blades to rotate in reverse to direct the warm air from under the ceiling downward and enhance the efficiency of your home heating system. And you will definitely like the option of completing this model with a remote or a wall switch for more convenient control and adjustment. 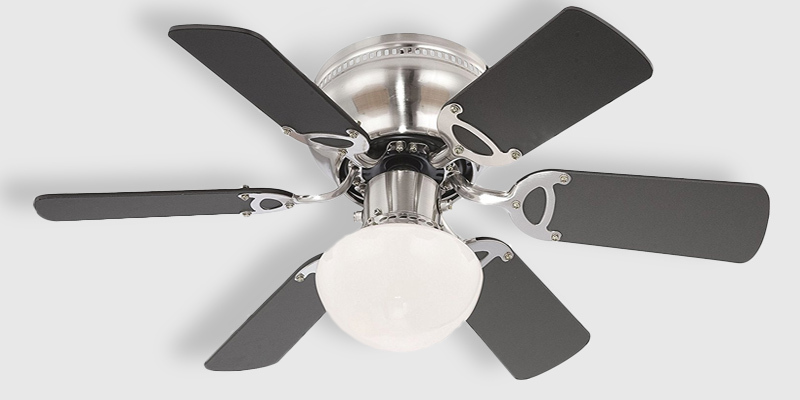 This chrome ceiling fan from Westinghouse offers basic functionality and reliable performance for you to feel comfortable in your dwelling all year round. Need a compact and silent ceiling fan for a nursery, your study, a guest room, a bedroom or a small playroom on the attic? If so, look no further. 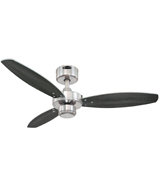 A low profile ceiling fan from Globo will perfectly cater to your needs. Featuring an impressively small diameter of only 76 cm, this model is specifically designed for small premises, cramped areas, and rooms with low ceilings. Yet, such diameter in no way compromises the airflow efficiency. 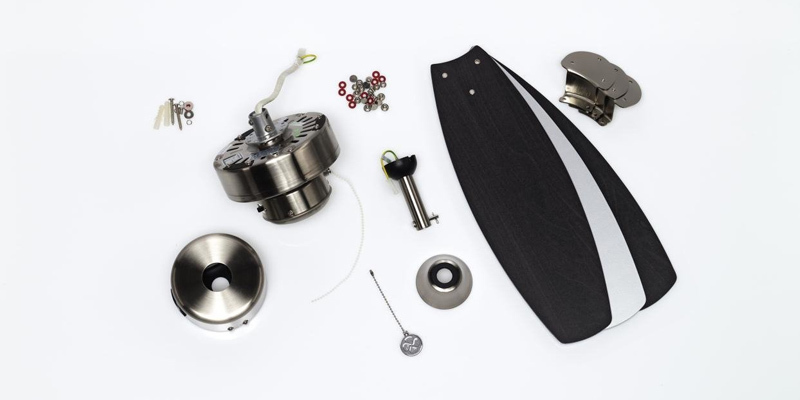 6 wide blades driven by a powerful motor can circulate up to 50 cu.m. of air per minute ensuring the coverage area of 12 sq.m. Meanwhile, 3 variable fan speeds will let you customize the airflow to your liking. 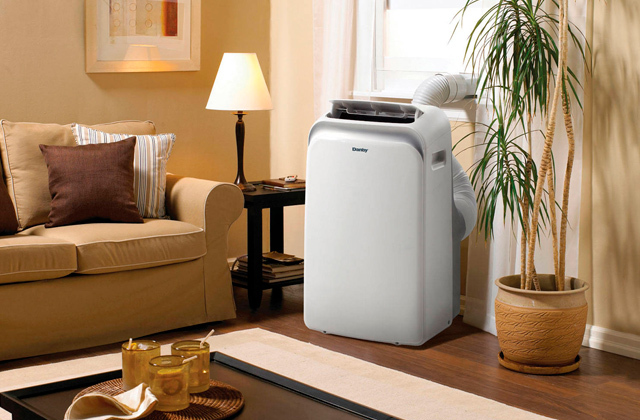 Thus, a high-speed mode works best for hot summer days when it might get pretty stuffy indoors and you need an intensive airflow to set up a favourable environment. Medium speed is a great choice when improved air circulation is needed, while a low speed will help create nice cooling ambience for a comfy night sleep. 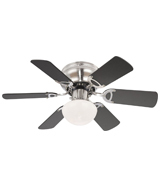 Like the majority of other ceiling fans, the Globo is suitable for the winter season as well. Just turn it to reverse blade rotation to enhance warm air distribution in the room. Fitted with an integrated light fixture, the model can also be used as an added light source. A lamp of frozen glass will dissipate soothing warm light for a cosy and homey atmosphere. Besides, the lamp is compatible with energy-efficient LED bulbs that will let you enjoy bright and functional light along with the air cooling effect, without increasing your energy bills. Compact yet efficient, the Globo ceiling fan will make a perfect addition to flats, summer cottages, small houses, and any small rooms. What Is a Ceiling Fan? When it is damn hot in a house in high summer many a man wonder what is the most efficient and secure way of maintaining comfortable temperature indoors. If you are not a fan of air conditioners for any reason we'd like to offer you an alternative appliance for this purpose. 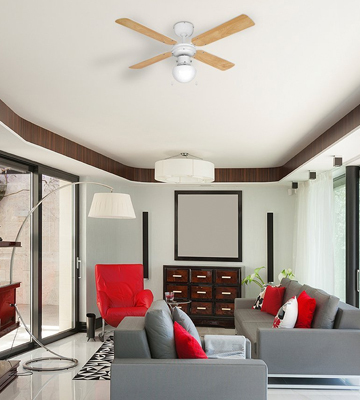 Ceiling fans are highly valued for their efficiency, the comfort they provide, and usability since usually they serve as both a fan and a ceiling lamp. However, people also tend to purchase ceiling fans in an attempt to enhance the interior design of their houses. Believe it or not but ceiling fans are available in a number of styles such as contemporary, traditional, modern, rustic, etc. So, even the pickiest consumer will find the best model to meet his/her requirements. Yet, the benefits listed above are not the uppermost and essential advantages you will get on buying a ceiling fan. For starters, these air coolers are highly valued for their cost-effectiveness as they consume less electricity compared to conventional air conditioners. Furthermore, a ceiling fan does not dry out the air in a room; it blows away the heat that surrounds your body and lets the natural cooling process work more efficiently and naturally. A ceiling fan would also come in handy in winter. 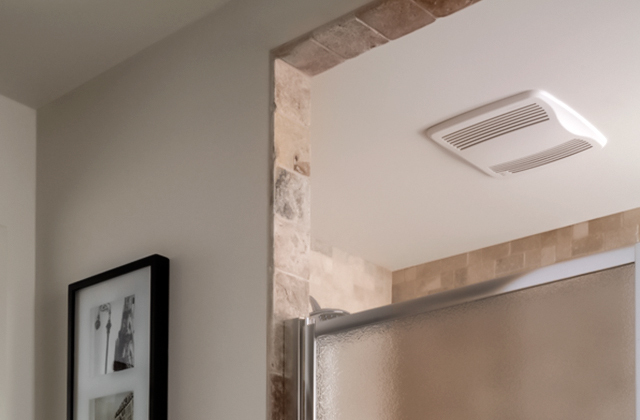 Just set it to rotate the blades clockwise to create an updraft—it will force the warm air near the ceiling to circulate down, distributing the heat from space heaters or any other heating device more evenly around the room. In such a way, ceiling fans will save you money on both heating and cooling all year round. It is not a secret that too dry air can affect your physical and mental health. Lack of humidity makes your mucosae become dry and leads to various respiratory diseases. 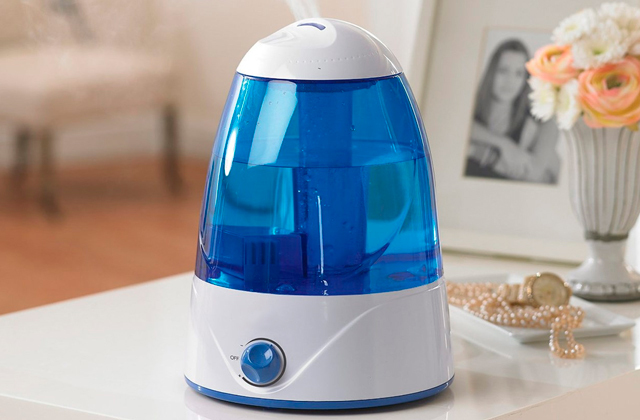 To avoid dire consequences, buying a humidifier might be the best solution. 1. How to Choose the Right Ceiling Fan, wikiHow. 2. 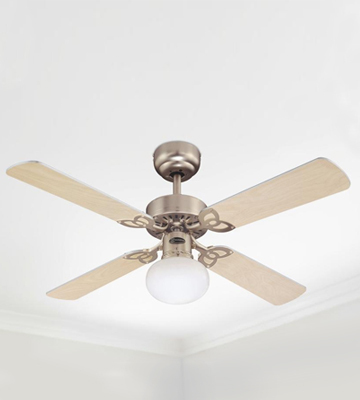 Fan Buyer's Guide - How To Choose A Ceiling Fan, Lumens. 3. 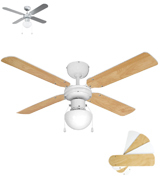 Ceiling Fan Buying Guide, Lowe's. 4. 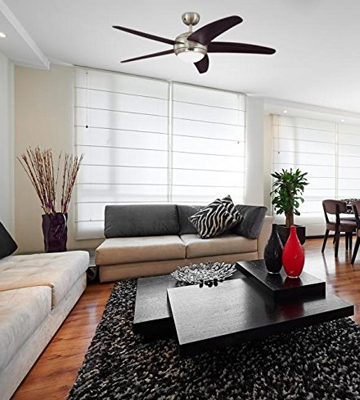 Harrison Astbury Ceiling fans vs air conditioning: the pros and cons, Canstar Blue. October 14, 2016. 5. Denis Gallagher Ceiling fan buying guide, Choice. October 13, 2016.